web 2.0 | Teaching and Tech. Edcanvas- a good way to present lesson content. I have been following the Whiteboard Blog (http://www.whiteboardblog.co.uk/) for some time now, and i have learnt about a couple of really good sites from Danny. 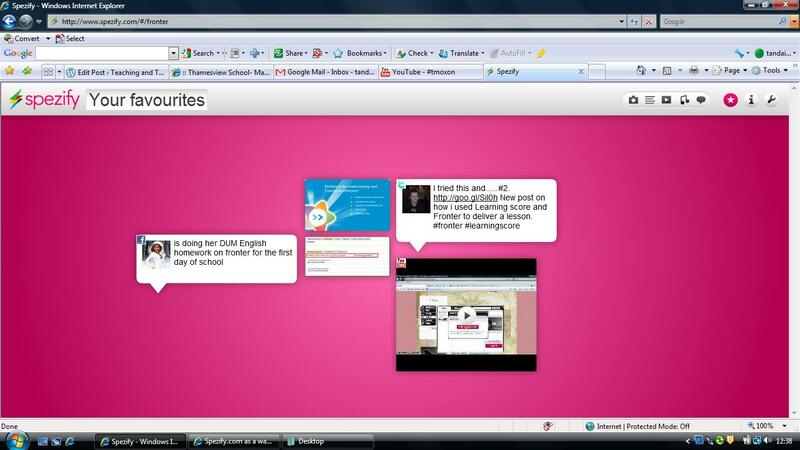 Recently he blogged about www.edcanvas.com and how it could be used to show students lesson content. I have had a look and tried it out, and it seems like it could be a really useful site. 1. As a way to get content to students in a 1:1 environment. Students can simply go to the link URL and access the lesson. 2. As a way of differentiating the lesson content in a computer environment. By that i mean that you can adjust slides for different levels, and then give students different URLs based on their ability. 3. As a way of sharing a bunch of links and videos for students to use or follow. QR codes and www.checkthis.com; practical use in the classroom. I have been experimenting in a few ways with QR codes at school at the moment, especially in my maths lessons. The students like using them, and think it is almost ‘magical’ the way that they work. From a teachers point of view, i like the way that a small code can be used to direct you to some really interesting work, or multimedia that wouldn’t normally be able to be put in books! I read a tweet from @joedale about a website called checkthis. When i went to the site it had the tagline, ‘somewhere between nothing and a blog’. This caught my eye. @joedale had suggested it could be good to use this site with QR codes, so i thought i would give it a go. The site allows you to insert text, video, images and links. We are currently doing data handling with yr7, and i thought that this site would be good for the students to do a summary page of what mean, mode and median were. After some technical difficulties (it was unblocked on teacher access, but blocked on students access!) the page worked quite well. The students researched some good youtube videos which helped explain the ideas, and found web links to games to help develop understanding further. They then published the page. The good thing is that you don’t need to register on the site, and just need to give an email address. Once this is done checkthis give you a unique address for your page, and it is this which fits with the QR code. The students then took that address and pasted into a QR code generator, printed off the QR code and stuck it in their books. This now means that i can scan the code and see a rich multimedia page with their summary on it, and they also have a revision page they can access. The ideas for this are really interesting. This could be ideal for an e-portfolio, or any revision type page. The codes could then be put into a table and a whole selection of page codes could be accessed. After listening to edtechroundup mention public folders on evernote I had a look at how they worked, and could see some really good uses for this. It is very simple to do, and once completed you are given a url for your folder. 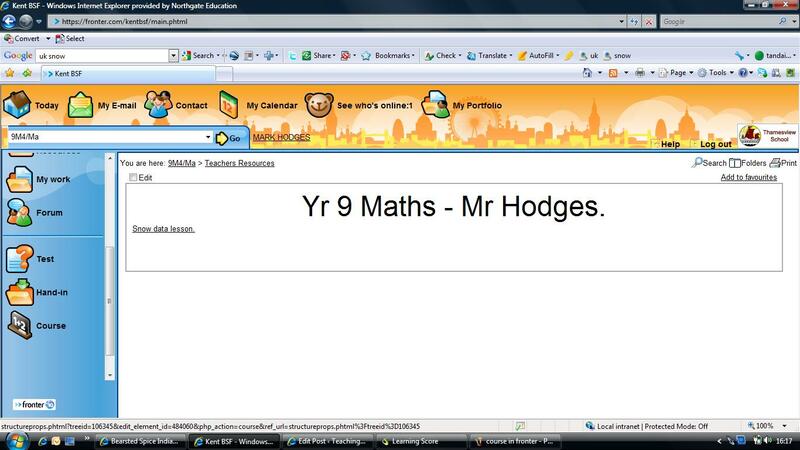 This can then be embedded into a website or VLE for students to access documents and files. This is slightly better than embedding documents themselves into the site as all the documents in an Evernote public folder are in the one place, and they are easily referred back to. Sync.in came to my attention from the excellent blog by Richard Byrne (see the post here http://bit.ly/icrvfq). It talked about the site being a way of collaborating on a document without the need to sign in or register. So i thought i would use this in one of my science lessons as a plenary, using it a bit like a ‘what have your learnt today’ exercise. There were one or two issues. Firstly, you can only have 8 people working on a document at one time, so not all the class could add their thoughts at the same time. This frustrated some of the class. Secondly, some of the comments were deleted by other people. In conclusion i would say that the site could be very useful to use with group work, and collaborating with students to add questions or suggestions. Check it out for yourself at www.sync.in. How do you think it could be used? Brain pop is a useful web resource for a number of subject areas, and they have now released a free app. This could be really useful for students to download and use in things like tutor time, or as a starter in maths or science. I have been a massive fan of Evernote for the last few years, and like it so much that i have become a premium user. As a teacher i have found Evernote useful for a number of things. I wanted to just list the things i find Evernote really useful for and why. Saving emails; with the integration between outlook and Evernote it is as simple as clicking a button to move a copy of an email into Evernote. I find this particularly useful to store important emails which i want to tag and use as evidence. The premium account means that the attachments are saved as well. As the managed service we have at school has a small user area size, this frees up space for other things in my school user account. Storing assessment evidence; students email me work and i move it to Evernote to have as evidence of my assessment with classes. Syncing from a file; there a number of different backup storage sites on the market. Dropbox and Syncplicity are two that immediately spring to mind. But Evernote makes it very simple to sync a folder across from my school network to any other device i have Evernote installed on. More on this in a later post to come. Storing tweets that catch my eye; I email my Evernote account with any tweets that i am interested in reading, which normally have web links that i want to look at on my laptop (i usually use twitter on ipod touch to read twitter). These are then easily accessed at a later time. As a bookmarking application; when i see webpages i would like to keep or refer to later, i add them to Evernote by using the web clipper. These main uses, and some others, mean that Evernote is a really important tool for me as a teacher, and is moving me towards an office with less and less paper. How do you use Evernote? Do you use Evernote? I would be interested to hear you thoughts. Spezify.com as a way of presenting. I have come across www.spezify.com recently, and thought that it might be useful for presenting information in an interesting way. The traditional way of presenting in schools is powerpoint, and the problem with this is that some teachers (and many more students) just read out the text that is on the screen. Not good practice! Spezify is at heart a search engine that delivers text, picture, tweets, sound and video based around your search term. You can then look at your search results and ‘favourite’ particular results that could link into your presentation. This then means that you can use the favourites to talk about, rather than talk from. You do need all your links and pictures etc in the favourites, and if you need to change your subject, you need to redo your favourites. Learning Score and Fronter (VLE). learning score is a lesson planning tool which gives teachers a way of bringing together multimedia and lesson overviews so students know where the lesson is going. @dougbelshaw did a good review of the software, which was developed by John Davitt, which can be found here. I read this review a good few months ago, and also heard John speak at a conference i attended, which got me thinking about the software. I looked at the website ( http://www.learningscore.com/) and downloaded the free trial to evaluate whether it would be useful for me. What i have found is that the ‘score’ (which is what i am calling the lesson plan) can be exported as a SCORM file, and as such, can then be embedded into Fronter (our schools VLE). This is useful for a number of reasons. Firstly it means i can store the score on the VLE, and not take up any of my limited storage space that the managed service gives me. Secondly, it means that the students can have immediate access to my lesson plan. They are then able to follow this, and see exactly where we are going. lastly it could lead to discussions about what style the group prefers, and enable me to refine future scores, for example more group or individual work included. 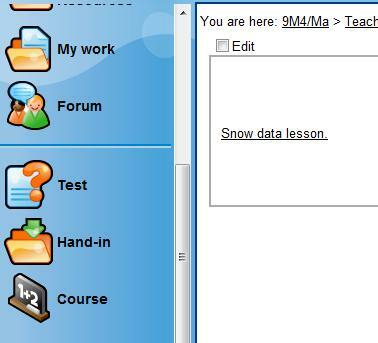 Here my link is the snow data lesson. This shows the Learning Score in Fronter as it appears. You can’t edit the score, but you can view it and interact with it. Any website links just need to be clicked on and they open in a seperate window. If you need any help with this please let me know and i will try to explain in more detail. I am going to try and document how i have used certain tools in the classroom (mainly web 2.0 stuff) and reflect on the impact and usefulness in my teaching. To start with i have been using www.jaycut.com as an online video creation site. It is really useful to use, as the creation of the video is very simple, and then the students can publish to their jaycut account and get a url for the video, or they can save to their documents. All they then need to do is to email me the link to the video and then i can mark the video and give them feedback. The students seem to like this idea, and i used it in maths to summarise the properties of triangles and quadrilaterals. This allowed them to create an individual video and show their knowledge of the key terms associated with the topic. All in all, it went quite well! What video creation tools have you used, and how did it go? Qr codes in the classroom. Firstly if you don’t know what QR codes are, here is a link to some more information, http://en.wikipedia.org/wiki/QR_Code , and a clip to show how they are used. I first started to get interested in QR codes after i read the blog of @mrrobbo (http://thepegeek.com/). He talked about using QR codes to identify different bones on a skeleton, and making worksheets ‘come to life’, or as extensions. As a starter; I have used QR codes as a starter with an ICT class, in a bit of a competitive way. I simply pointed them at my site, which i use for resources and tutorial videos, where i had embedded a QR code which simply told them a key word to tell me. I gave them absolutely no help. They had to research what QR codes were, how to read them and then actually read the code! It took the quickest group about 7 minutes from never seeing them, to telling me the answer! I am sure this idea will continue to grow, and as i explore more with QR codes, i will keep posting thoughts here. How have you used them?